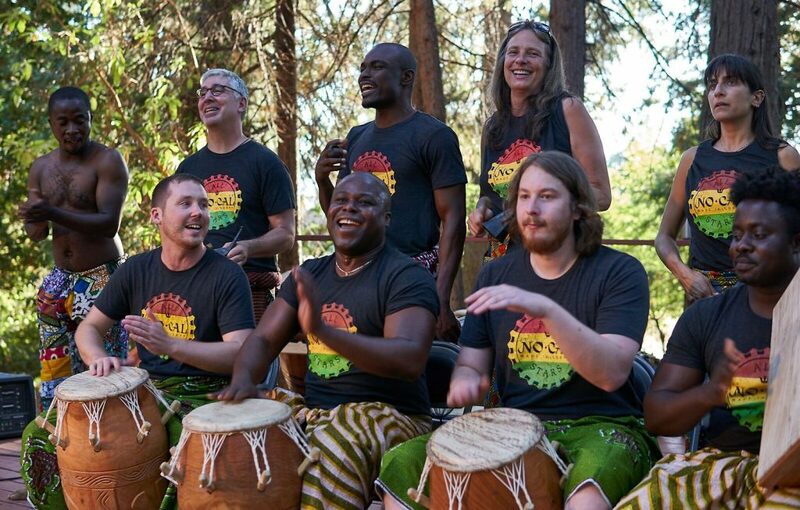 Traditional West-African drumming and dance will shake Pioneer Park in Nevada City on Saturday, August 25 when the East-West Ghana All-Stars return to rock the foothills. The East-West Ghana All-Stars are a traditional, high-energy drum and dance troupe founded by the top Ghanaian musicians now living in the United States. From all corners of America, they come together a couple of times a year with their top US students to put on an artistically unmatched demonstration of their craft for lucky US audiences. You’ll be treated to an evening of traditional Ghanaian music and dance unlike anything seen outside of West Africa itself. Aside from swaying to the rhythm during the show, it is an All-Stars tradition to invite audiences to stand up and participate at the end. The East-West Ghana All-Stars are led by Artistic Director, Nani Agbeli, one of the top Ghanaian dancers of his generation, who runs the African Music program at CalArts in Los Angeles. He thrills audiences with his athleticism, charisma, and precision. Attah Poku is a phenomenally powerful drummer who was the lead drummer for the King’s palace in Kumasi before coming to the US to teach drumming and dance at Tufts and Wesleyan Universities. Kwaku Manu is a highly skilled dancer and drummer who honed his craft at the University of Ghana before arriving in 2010 to assist the legendary C.K. Ladzekpo, teaching Ghanaian drumming and dance to students at U.C. Berkeley, Cal State, and the East Bay Center for Performing Arts. Francis Kofi Akotuah taught traditional music and dance at the University of Ghana for two decades, mentoring many up-and-coming performers as well as introducing countless students from around the world to Ghanaian music. He has performed with Ghana’s leading ensembles and conducted workshops at universities in the US, Canada, and the Netherlands. Their American students are lifelong devotees of Ghanaian music and dance, and have all traveled to Ghana extensively to study and perform. They are all excellent drummers, dancers, and in most cases, teachers in their own rights. They include Joe Galeota, who teaches African Drumming and Dance at Berkelee College of Music in Boston, Faith Conant, who teaches African Drumming and Dance at SUNY Stonybrook in NY and Mount Holyoke College in Massachusetts and Philip Ago Agyapong, who teaches West African Dance at USF and Mills College.